Emily Finegan graduated from Indiana University, Bloomington in 2003 with a Bachelor of Science in Kinesiology and a minor in Psychology. Then, she graduated from Nova Southeastern University in 2005 with a Bachelor of Science in Physician Assistant Studies and a Master of Medical Science. Emily Finegan, P.A.-C has been with our practice since 2007 and has an outstanding reputation with our patients. 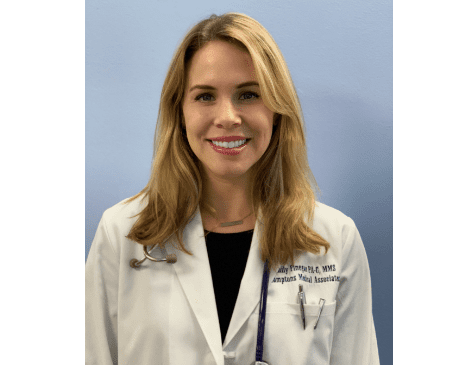 With nearly twelve years experience as a practicing PA in family medicine, women’s health and dermatology, Emily Finegan also has over nine years experience in aesthetic medicine. Hamptons Medical offers an array of cosmetic procedures including injectable fillers and neurotoxins, skin resurfacing, scar removal, hair removal, fat reduction and body contouring. Emily is also trained in our newest available products including Kybella and Volbella. Emily is a preceptor for Physician Assistants at Nova Southeastern University and Nurse Practitioners at Simmons College in Boston. Emily is dedicated to helping others stay healthy while providing the tools and knowledge to better their health and overall well being!